The long life of Miss Alice Rumphius, who never marries, included work, travel to exotic places, a beautiful home by the sea, and making a difference in the world… sigh, not too shabby. 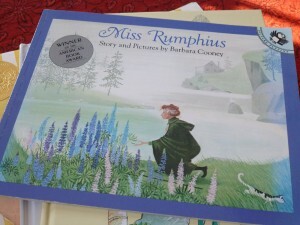 The book Miss Rumphius has also had a long life, first published in 1982, and it is still much loved by people of all ages. Often called “the lupine lady,” it was written and illustrated by Barbara Cooney who illustrated many books for children, but stated this was the one “closest to her heart.” I believe this book has endured, in part, because it shows us a fulfilling life from childhood into old age—something we all aspire to. Young Alice loves and respects her own grandfather, who tells her to “do something to make the world more beautiful.” I love that Miss Rumphius leaves a legacy to younger generations—sowing the countryside with the seeds of colorful lupine flowers. I also love that she is passing on the legacy of her grandfather’s wisdom. This book realistically shares the uncertainty, even fear, of children who initially see Miss Rumphius only as a very old woman, but then later sit at her feet to hear her stories. It also shows that old age can include illness. Miss R.’s back problems keep her in bed for a time, but she recovers to hike the hills once more. Sharing this lovely picture book with children we are given the opportunity to talk with them about both positive and negative aspects of getting older, and the strength and resilience of our elders. We can discuss with children both the goals and challenges that older adults might have, and also the fact that despite changing bodies people of all ages are really the same in so many ways. Seize the chance to take note of just what you value in the older people you love, and share that legacy with your children. But also consider sharing it with them. Years ago I gifted my own mother with this beautiful and lyrical book, and thanked her for teaching me to notice nature’s gifts. This entry was posted in Book Reviews, Book Reviews for Ages 6-9 and tagged Ageism, Appearances, Challenges, Favorites, Happiness, Intergenerational, Life stages, Nature, Values, Women. Bookmark the permalink.